Graphite MacBook Sleeve adds another dimension to the classic laptop case, offering an innovative solution for the student or entrepreneur who wants to keep their essentials all in one place. Perfectly sized for an 11” MacBook Air or device of a similar size, the unique GRID-IT organiser system gives this laptop sleeve an extra layer of functionality. Smart, stylish and incredibly practical, it’s an essential companion for your technology. Tailored to accommodate a slim, 11” laptop, this compact sleeve is ideal for Apple owners. 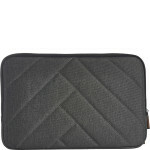 Padded to protect your device, this premium laptop case is lined with a plush faux fur interior. Arrange your stationery and accessories in the GRID-IT elastic organiser system, in a zipped comportment to the front. 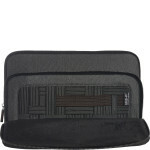 Carry your gadgets without worrying about the weather; the ballistic nylon exterior is hard-wearing and water-resistant. Gunmetal zippers with wooden pulls are a stylish addition to the case, opening wide for easy access to your essentials. 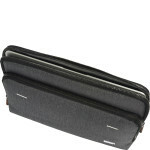 Graphite MacBook Sleeve 11-Inch Laptop is an all-in-one solution for carrying and organising your everyday basics. A protective sleeve with clever design, it balances practicality with style for an accessory that won’t let you down. 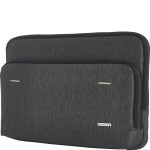 Accommodating an 11-inch MacBook Air in the padded compartment, this laptop sleeve has a plush, lined interior to protect your device from bumps, dirt and scratches. A front compartment features the iconic GRID-IT organiser system for which Cocoon is renowned, with flexible, woven elastic that makes it easy to arrange your pens, accessories and gadgets. Zipped closure keeps your essentials secure on the move, with wide opening for convenient access and wood zipper pulls for a premium touch. 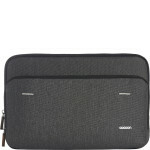 Constructed from water-resistant, ballistic nylon, this MacBook sleeve is an indispensable accessory for your device. Made from tough, thick ballistic nylon and padded throughout, you can have confidence when carrying your laptop in this sleeve. Durable and water-resistant, it’s designed to protect your gadgets from the elements when on the move. 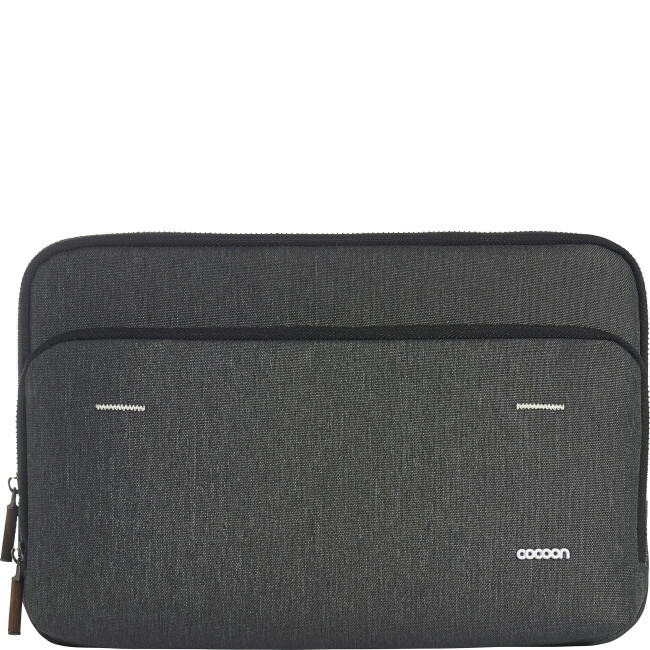 Use a clean, damp cloth to remove dirt and marks; do not machine wash.
Cocoon is a modern, forward-thinking brand that is constantly on the lookout for better ways to protect your gadgets, organise your belongings, and make your life easier. Their innovative collection of bags and laptop cases all feature the unique GRID-IT organisation system, a flexible solution that keeps your everyday basics to hand.